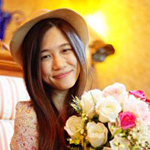 These earrings are from jewelry artisan Phat Tangmo. 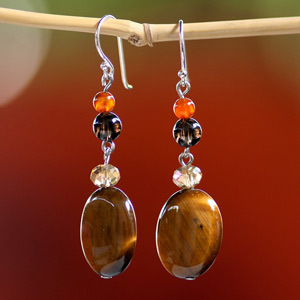 She crafts the lovely design by hand with tiger eye, smoky quartz, carnelian and glass. Threaded on stainless steel strands, they hang from sterling silver hooks. 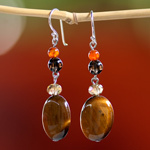 Materials: Tiger eye, smoky quartz, carnelian, glass and sterling silver (.925).